Through the story of a thirteen-year-old black boy condemned to life in prison, Elaine Brown exposes the ’New Age’ racism that effectively condemns millions of poor African-Americans to a third world life. 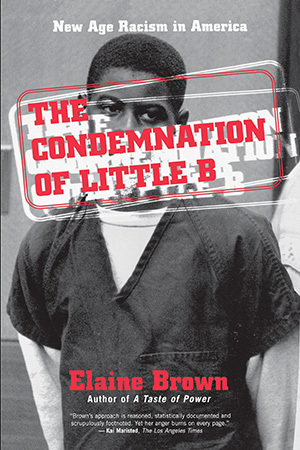 The story of ’Little B’ is riveting, a stunning example of the particular burden racism imposes on black youths. Most astonishing, almost all of the officials involved in bringing him to ’justice’ are black. Michael Lewis was officially declared a ward of the state at age eleven, and then systematically ignored until his arrest for murder. Brown wondered how this boy could possibly have aroused so much public resentment, why he was being tried (and roundly condemned, labeled a ’super-predator’) in the press. Then she met Michael and began investigating his case on her own. Brown adeptly builds a convincing case that the prosecution railroaded Michael, looking for a quick, symbolic conviction. His innocence is almost incidental to the overwhelming evidence that the case was unfit for trial. Little B was convicted long before he came to court, and effectively sentenced years before, when the ’safety net’ allowed him to slip silently down. Brown cites studies and cases from all over America that reveal how much more likely youth of color are to be convicted of crimes and to serve long-even life-sentences, and how deeply the new black middle class is implicated in this devastating reality.